A man of many characters. Comedian, actor, radio presenter, musician. Studied Acting at the Anna Scher Theatre and since then has gone on to do several films, commercials, TV work, Theatre and is now a comedian doing various sketch and stand up shows. 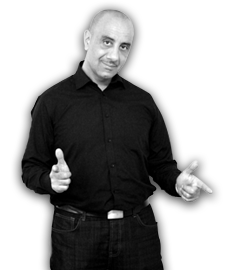 Andy presents ‘The Meze Show’ on London Greek Radio, on Sunday between 9pm-12 midnight, which is the last show of the week, preparing you for the week. Playing you a mix of old and new hits. He mixes up the best Greek and English tracks. His passion for music reflects in his shows, with just the right amount of witty banter. Tweet him your shout outs!